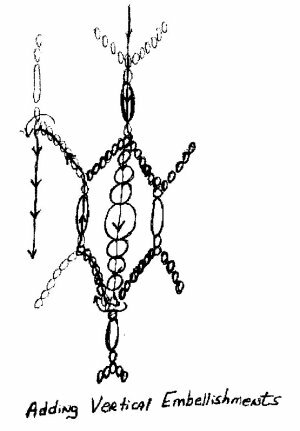 Christmas Ornament Instructions BY EagleWoman Designs aka Ginger Rakes-Fisher This is my adaptation of a pattern found in Beaded Dream Catchers by Mary Musgrove. It's based on a flower pattern that is usually used to make earrings. I wondered if I could play around with it and make it curve to fit a glass ball. After several tries I got it to work. Hope you can understand the instructions. The seed bead counts for the tops of the petals are what I used. You may need to change the number if you use czech seed beads. If you need clarification on any part of the directions email me (Ginger Rakes-Fisher <grakesfisher@netscape.net> and I will try to help. Materials: 3" glass ball JP 11 seed beads (about 10gms) rice beads graduated sizes round beads (I used four sizes of "pearls") Round 1: String 12 seed beads, leaving at least a 6 inch tail) and go back in the same direction through all the beads to make a circle. This will be the bottom of the ornament. Round 2: String one seed bead, 1 rice bead, one seed bead, (this makes one SIDE) then string 7 seed beads (this is the TOP) , one seed bead, one rice bead, one seed bead (for the other SIDE).. Go back through the first seed bead in the circle to complete the loop and then through the next seed bead in the circle. Make the side and top of another petal and go down through the first side of the first petal. 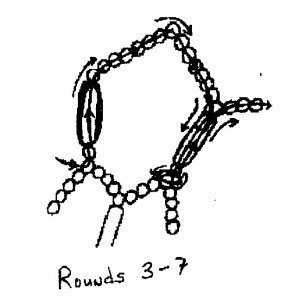 (see diagram below) Go back through the the second bead of the circle and the next bead. Keep doing this until you have 11 petal loops completed. For the 12th petal go UP through the closest side of petal #1, add 7 seed beads for the top, then do down through the side of petal 11. Go through bead 12, and 1 in the circle , come up through a side of a petal, and through four seed beads of the top. You are now ready for the next round. Round 3: Make one side (1 seed bead, one rice bead, one seed bead), the top consisting of 11 seed beads, and another side. Go through the fourth bead of the top of the next petal, and back up through the side. Add 11 seed beads, one side, and go through middle bead of top of next petal, back up through the side of petal just strung. Continue around through 11 petals. String on 11 seed beads, go down through the side of first petal. Work thread back down to meet tail you left, tie off and bury ends. (I start a new thread every two rounds, so if one breaks, you don't lose the whole thing.) Round 4.: Do the next round exactly as above using 15 seeds for the top of your petal. Round 5: Do another round using 11 seeds for the top of petal. Round 6: Use 7 seeds in this round. You will need to place this on your ornament when you get about half of the petals done on this round. Round 7: Use 5 seed beads for the top of the petal in this round. Be sure to pull tight as you work this round, so the thread doesn't show between beads. 8. Now using the size of round bead you prefer, go through the middle bead of the top of last round, add round bead, go through next middle bead of the top of next petal, add a round bead, ---keep doing this until you come back to the first round bead. Go through all the beads again and pull tight. Take thread back through beads to tail you left on previous round, tie off and bury thread ends. Now for the vertical bead embellishments. Go through the side of a petal in round three so you are coming down into the space of round four. 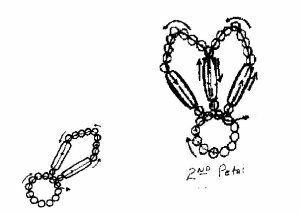 (leave a 3 to 6 inch tail) String on your graduated round beads, and go down through the petal side of round 5 directly below. . Go through beads until you come up into the next space of round four, add round beads, go through side of petal in round 3. Continue until all of round 4 spaces are filled. Work thread back to tail, tie off, and bury ends. YOU'RE FINISHED!!!! Hope you had fun!! !